Students will only be admitted into the program with the approval of the Artistic Director. 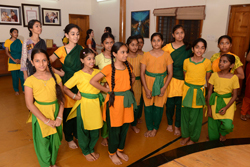 Traditionally, new students join on Vijayadasami, an auspicious day in the Hindu calendar. Admissions are accepted thrice a year : July, Vijayadashami day of every year, and January. Minimum age for joining is 7 years of age. Please complete all of the following information to begin the Enrollment process, and email your completed form. We will then be in touch with you in a few days. What class location are you interested in?